At around the time of the unification of China, over two-thousand years ago, a small text appeared. It became the text of the Taoists, a motley crew – who could only have been born in China. It was later revised and authorised by the Han (c. 200 AD). 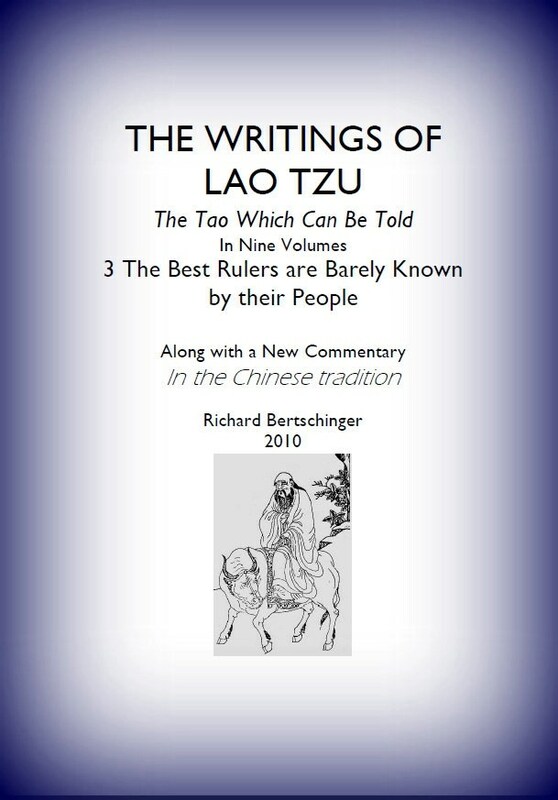 The Tao-te Ching, or The Writings of Lao Tzu exist as some eighty -one chapters (eighty-one is nine times nine, nine was the Heavenly number) and is divided into two halves. The the first half concerned the Tao, the Way or Path, the second the Te, its virtue or power. 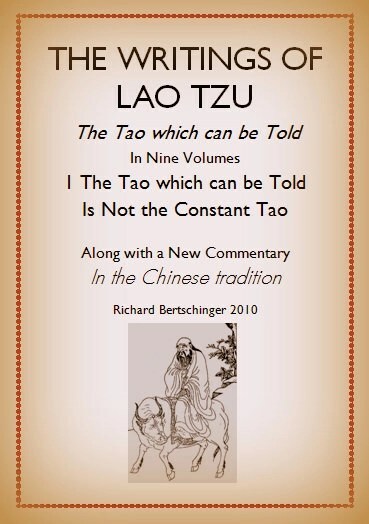 Taoism points to something more than words and this small book provides a key to the subtlety of thought and gentle touch so distinctly Chinese. This is a work of inward cultivation, a spiritual tract giving instruction in breath-control and meditation, as well as a treatise on government. Click FirstFewPages to read t he beginning of this booklet. 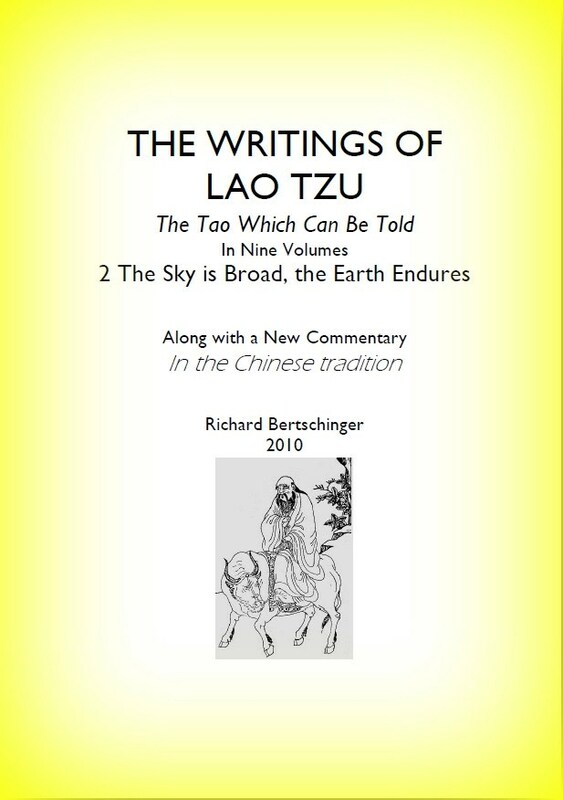 Containing the chapters Shielding the Light, and Adaptable in Nature (the famous chapter on the soft and yielding qualities of water), this Volume further develops the theme of Lao Tzu’s introductory rant. Practicing Detachment leads us to the first of the great chapters on meditation – What Can You Do? – which begins…guarding the fort of the spirit and embracing the One, can you not depart from it?. The avocation is plain and simple. To allow growth but not to command it, therefore this may be called Hidden Virtue! This beautiful verse with its lapidary style brings to a close the opening of the Tao-te Ching. The stations of the Way have been described. The scope moves from the ‘small me’, humble and empty, to the ‘big me’, large as life and one with Heaven and earth. This is returning to the root. To put aside passion and cast off desire sums up the previous chapters. As a Taoist prayer Chapter Sixteen asserts faith in eternal life. The theme of this third volume may be summarized as how to find out what is genuine in the human condition. Real skill and talent is a thing, almost mysterious. A natural humility is shown in one who finds the Tao. As twenty-two / the benefits of yielding states: “if you can yield, without revealing your ideas, a lamp may light up within your heart and you see the true character of things. This is your true nature.” There is no need to say anything because the brightness of the heart shines forth. The right is obvious. This section also describes the true implications of wu-wei – or non-action, which are further developed in the next volume To Know the Male, but to Guard the Female. Beginning with a discussion on the best rulers of antiquity, the chapters build towards the striking line, ‘banish learning and put an end to your troubles!’ We should not be surprised by this outspoken voice! For the former verse declared ‘banish the sages and renounce cleverness, lessen self-seeking and reduce desire’. Now Laozi speaks directly, if uncertainly, to the reader in a confessional. Twenty / different from the crowd’: ‘they are so bright and clever, whilst I alone am unsure, they are so certain, whilst I alone am depressed. I feel stupid and awkward, I alone am different to other people’. 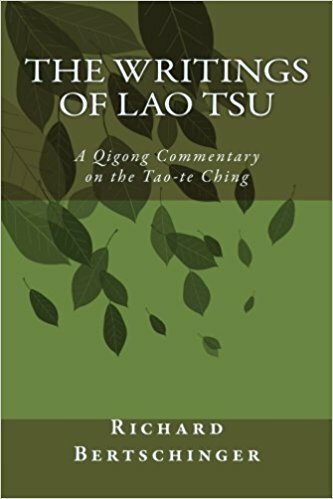 Now follows a description of the Tao: ‘there in a flash and gone again!’ (twenty-one / humility in the heart ) – with a paean to forbearance. This is the ‘greatest virtue, which alone comes from following the Tao’. Then come the famous lines ‘yield and overcome’, ‘to speak but rarely is natural’, ‘a high wind does not last all morning, a rainstorm does not last all day’. And then ‘he who tiptoes will never stand’, and so on. Truly the one in the Tao is different, he/she knows how to ‘shield his/her light’ – so unlike the Christian ‘not hiding your light under a bushel’. Twenty-seven / a turn of skill concludes: ‘the best walker leaves no track, the best speech finds no censor’. ‘The best calculation uses no counter, the best door has no key yet no one can open it, the best knot uses no binding yet no one can untie it.’ Indeed this is something different. This Book is Now on Amazon!